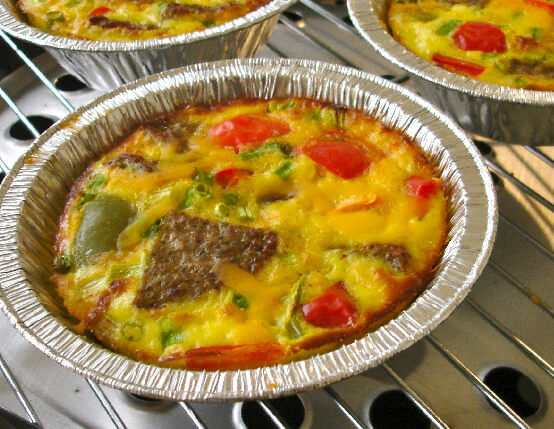 Made in mini aluminum foil pie plates, these protein-packed turkey sausage egg bakes are perfect for camping—or avoiding dishes at home. 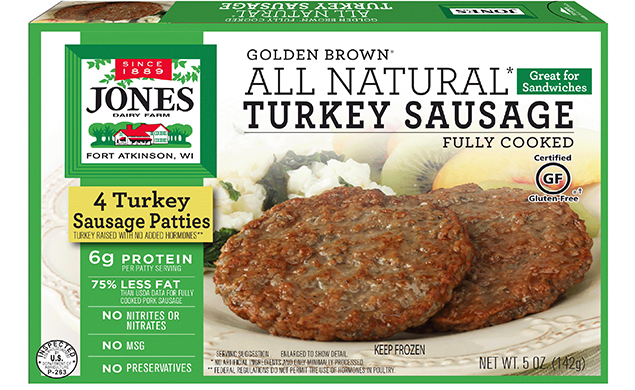 This recipe is made with Jones Golden Brown® Turkey Patties. Prepare grill to indirect heating and heat to medium heat. Or preheat oven to 350˚F. In large bowl, mix together eggs, milk, salt, pepper and seasoning. Generously spray 4 small (5-inch diameter) disposable foil pie pans with non-stick cooking spray. Divide egg mixture evenly between each pan. Sprinkle with cheese, peppers, onions, and sausage. Cover each bowl with aluminum foil and place on grill or in oven; cook for about 20 minutes. Check for doneness by ensuring that the eggs are firmly set. Remove pans from grill and let cool until touchable, being careful not to burn hands. Remove aluminum foil from top and enjoy directly from pan. I will make this again. It was very tasty with all the cheese. I forgot to put foil on the top, but they were still moist, not hard or tough on top.